Oats processing rolling line referes to oats flakes processing line or oat flaking plant. Oats are increasingly popular as a tasty foodstuff. And Win Tone Machinery can manufacture excellent oats processing rolling line and help our customers build oat mills and develop suitable oats machinery and processes. Finish products by Win Tone oats processing rolling line are distinguished by their pleasant taste, good shelf life and easy digestibility. 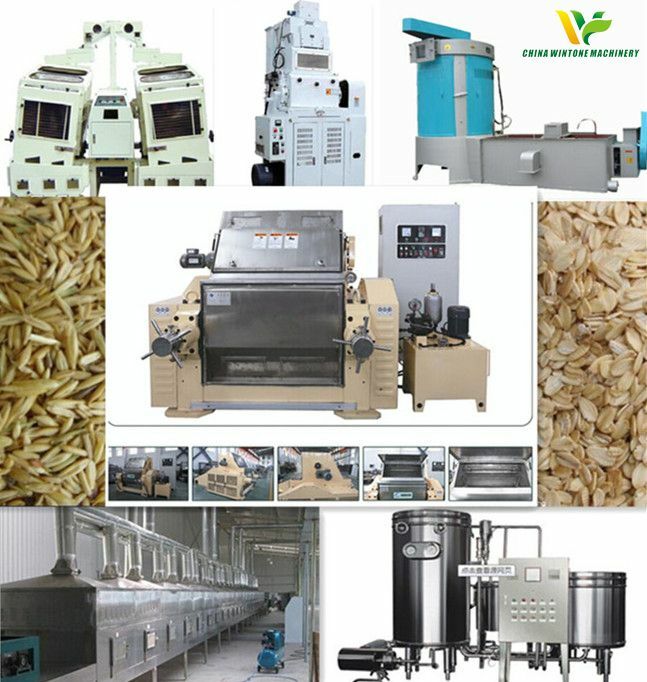 Core equipment of oats processing rolling line: oat flakes machine, which adopts totally enclosed safety protection. Its tooth roller design has the reasonable inner tooth-reverse form. It has fine workmanship, high yield, reliable performance and can produce qualified oat flakes. First, the naked oats are processed by cleaning and steam softening. Then the material passes the feeding device of the oat flakes machine, and is sent continuously and evenly to the place between the two rollers which have certain interval and pressure. Next, the oats are rolled into flakes according to the technological requirements. Then it has a centralized processing by scraper device and enters the next section. If there has foreign hard matter mixing into the material and entering between the two rollers, then the hard matter will force the two rollers to be affected by a reactive force. It struts the tooth rollers forcibly by hydraulic system (or spring effect) so as to make the tooth roller, shaft block and bolt have effective protection. After the hard matter passing, the tooth rollers recover to the normal working station automatically. 1. Cleaning: oat has the similar cleaning process with wheat. The cleaning method is based on the granular size and gravity difference. We can get net oats after several processes of cleaning. The equipments for cleaning are: precleaning machine, vibrating screen, peeling machine, de-ironing separator, rotary screen, specific gravity sieve. 2. Peeling and whitening: its goal is to whiten and remove dust. It just needs gentle friction to remove oat fur and skin. 3. Cleaning and spin-drying: peeling, cleaning and then spin-drying. 4. 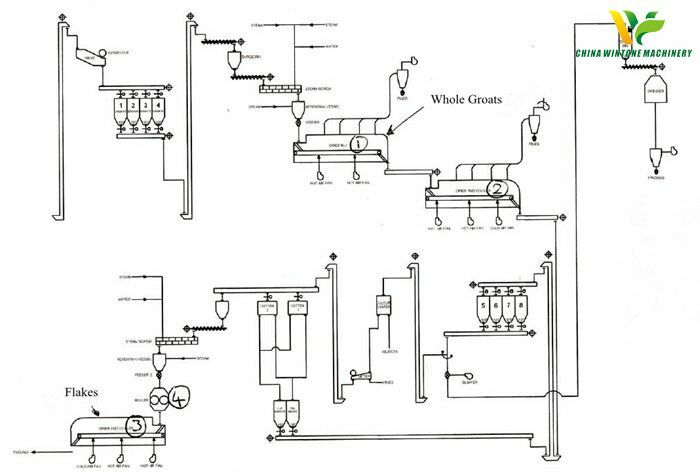 Thermal treatment of enzyme deactivation: without thermal treatment of enzyme deactivation, oats fat will be oxidized in processing and affects products quality and shelf life. This method can deactivate enzyme, make oat starch burnt and increase baking taste. We use infrared ray or far-infrared heating equipment for this method. After this processing, oats should enter into the next section or should be forced cooling in time to prevent oat grease oxidation of overheating. 5. Cutting: cutting oats into 1/2- 1/3 granules by drum granulator. The oats flakes after cutting can keep unanimous and are easily laminated into thin flakes without powder. 6. Steaming: furtherly deactivating enzyme and sterilizing. Making starch become instant food, and making oats smoothed and softened for flaking. We use retroflex cooking machine for steaming. 7. Flaking: flaking by double roller flakes machine and keeping the flakes thickness for about 0.5mm. The roller diameter of the flakes machine should be 200mm. 8. Drying and cooling: drying and making the moisture reduce to 10% below for easy storage. Fluid bed dryer is the ideal drying equipment. Then it needs cooling to normal temperature after drying. 9. Packaging: we usually adopt material with good gas tightness, such as aluminium film, polypropylene bag and polyester bag. Besides, oat flakes are instant food which has higher sanitary requirement and needs sterile production system.